Buhera West MP, Saul Dzuma. MURAMBINDA - The Business Community in Buhera has blamed the 2% tax that was put in place by the Government at the beginning of October for the price hikes that the district and country as a whole is facing. 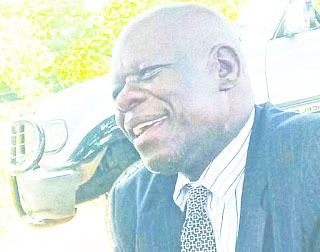 Murambinda Business Community chairperson Searchmore Kudenga told Buhera West MP, Saul Dzuma at a meeting held at the Growth Point recently that the 2% tax for every dollar transfer is exerting pressure on the retailers, hence, they end up passing on the burden to the consumers. “We the businessmen in Buhera have noticed that the 2% tax introduced by the Government is playing a major role in the issue of price hikes because by overcharging the goods, retailers are trying to make profit and retain the money they would have lost during transfers. Government should seriously consider revisiting that policy because it is affecting business,” said Kudenga. He pointed out that the $300 cash they get from banks to use in a week is not enough for businesses and Government must also review that. He said bond notes are in short supply compared to bond coins. He said this negatively affected retailers as wholesalers demanded bond notes and US$ only. Dzuma promised to have the views tabled during a national budget meeting to be held in Victoria Falls on Thursday. “I promise to assist by linking you to suppliers of basic commodities and help you get permits to order directly from the producers. That way you will avoid exorbitant prices charged by the wholesalers and third parties,” said Dzuma. Joseph Mawoyo said exemption of duty for goods worth $199 and below is of no value to business people who import because they need more than the $199.